Our Meditation Oasis® Podcast features guided meditations, instructions for meditation, and music for meditation. You can listen to it at iTunes or Google Play or by clicking on the play buttons below. Episodes are listed from the oldest to the most recent. Tap on the green button to view recent podcasts. If you are benefiting from our podcast, please consider helping to support it. 100% of every donation is used to maintain the podcast and create new episodes. Episode 60 — January 29, 2019. Learn to relax when anxious with this simple, soothing meditation. Belly Breathing is an especially relaxing and grounding practice than you can learn and do on your own. Our gift to you from our At Ease — Anxiety & Worry Relief app. Episode 59 — November 7, 2018. Let this simple Autogenic Relaxation technique help you relax into sleep. Our gift to you from our iSleep Easy app. Episode 58 - July 13, 2018. A brief meditation to help you reset and fall back to sleep when you awaken in the middle of the night. Useful when your emotions and thoughts are running wild. Calming and reassuring. Episode 57 - March 1, 2018. Relax and release tension from your entire body. Use before bed or any time of day. From our Relax & Rest app. JUST FOR FUN - special bonus, soon to be added to our podcast -- If you like our guided meditations and you like electronic music -- you will love this! Bassic (a.k.a. Martin Lindhe), a Swedish-American composer of electronic music, sampled one of Mary's meditations and made this relaxing piece -- Effortless. Episode 1 - November 7, 2006. Enjoy this meditation anytime you need a deeply relaxing break. From our Pure Relaxation album. Episode 2 - November 14, 2006. Recorded live with Mary's guided meditation group. Helps integrate mind and body, bringing you into the present moment. Is calming, balancing and grounding. Episode 4 - January 3, 2007. Use this meditation to experience silence within. A more advanced version of the Breath Awareness Meditation, you may need to work with the Breath Awareness Meditation before trying this one. Episode 5 - January 19, 2007. Enjoy this meditation when you feel pressured, are struggling, or simply want to be "more in the moment". Once you've used it enough times, you'll find you can do it on your own. Episode 6 - February 2, 2007. In response to requests, this is a track of music alone. Use this while you do your own meditation or as a background as your work or relax. You can also use this music as a meditation (read more). Episode 7 - March 6, 2007. This meditation helps the emotions flow more freely. Listen to it to it when you feel rough or simply want to experience greater ease. Episode 8 - Apr. 6, 2007. Given the opportunity, it's natural for the mind to settle down. This meditation will help you to become aware of this natural tendency and allow it to take you "deep within". It's a somewhat advanced meditation in that the awareness has to be settled enough to notice that natural inward movement. Using some of the other guided meditations can help prepare you for this one. Episode 16 - Dec. 18, 2007. 10 min. This meditation is designed to enhance your experience of "aliveness" and help you enjoy the fulfillment of simply being alive. If you are new to our meditations, you might want to try some of our others before using this one. It's a bit more abstract and "subtle". Episode 22 - Jun. 16, 2008. Mary comments on a listener's email -- how to listen to these meditations. This episode can bring insights about meditation and enhance your experience. Episode 23 - Jul. 2, 2008. Use this meditation when you are having difficulty living with change. It's designed to help you move through it more easily -- to let go of resistance, relax into your reactions to change, and discover that which never changes. Episode 25 - Oct. 15, 2008. You can experience peace even during challenging times. Listen to this meditation to discover peace within, especially when you are experiencing tension or conflict in life. Episode 34 - Nov. 6, 2009. 20 min. (with music, last 5 min. music only) This meditation uses visualization to help you to wake up and energize your body for the day. Be playful and creative with the visualization process, doing what works for you. Episode 43 - Sep. 13, 2011. Use this meditation to open a meeting. It will help you to center and become more present. Use alone or in the meeting group. Episode 51 - Oct. 9, 2015. This meditation will be especially helpful when you feel scattered and ungrounded. It will help you relax deeply, becoming centered and calm. Episode 52 - Feb. 19, 2016. Experience stillness in the midst of busyness. Find the quiet, still center in your own awareness. Episode 53- June 19, 2016. Experience and celebrate life’s gifts and plant the seed of your deepest desire going forward. An opportunity for gratitude and remembering what really matters. Episode 54 - Sept. 17, 2016. Enjoy this beautiful, reflective meditation to find perspective, balance and peace in the midst of change. Episode 55 - Nov. 30, 2016. Find a calm and centered place when anxiety has been triggered by a stressful situation. Episode 56 -- May 20, 2017. Enjoy being fully present to all of the experiences you have while walking -- what you experience within yourself and in the world around you. Podcast Copyright 2006-2017 Mary and Richard Maddux. All Rights Reserved. Please contact us if you wish to use these audios for anything other than personal use. 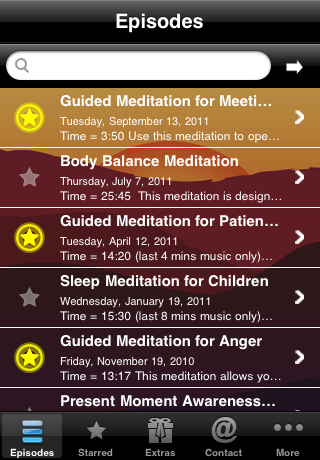 The Meditation Oasis Podcast App (from Wizzard Media) is the ideal way to listen to the podcast and get the most out of the podcast. See details at the iTunes store or on Amazon.com if you have an Android phone. Richard's beautiful music is available on CD's, as mp3 downloads, and in smartphone apps! We have three compilation albums -- Pure Light, Sleep Oasis and Peaceful Mind, Open Heart. Get them on iTunes, Amazon.com or gumroad. Also check out our music app: Attunement for iPhone, iPad, iPod Touch and Android devices.